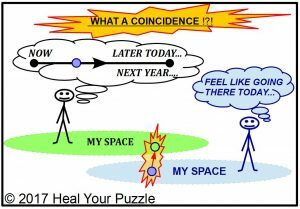 Heal Your Puzzle » Blog Archive » Aware of any Coincidences Recently? Happen to be in the Right Place at the Right Time? Aware of any Coincidences Recently? Happen to be in the Right Place at the Right Time? Last month, I wrote about Multi-dimensional Reality… as a follow-on from that, I am writing about those magical coincidences that sometimes change our lives in a split second…!! 1) The state of occupying the same relative position or area in space. 2) Sequence of events that although accidental seem to have been planned or arranged. Coincidences often feel like they were just ‘meant to be’; they feel reassuring and sometimes answer your prayers or fulfil a dream. They usually feel very spontaneous, not your usual routine and may have resulted from following your instincts to do something which leads you to that Moment… what is actually happening with you? Is it accidental? Is it a ‘Sign’? Being more Conscious of your Space I wrote before about BE-ING more in tune with your Body and your Life and how this reduces stress… managing your Time is a significant landmark towards this… but to be more in tune with not just yourself but also others there is the added Dimension of being able to manage and influence your own SPACE, your ENVIRONMENT… Doesn’t sound difficult but have you ever felt like you needed to be in 2 or 3 places at once? Or different roles in your life were clashing eg. Family commitments messing up your work schedule or getting to the gym regularly? Conversations being out of sync?